My worst pain since was not this. I thought it would be. Zip lining in Thailand, on the last run of the day, I was the last person to go. We were all hot, tired, sick from fumes of mosquito repellent, and ready to be done. The guides were not paying attention. They did not keep the ropes taut, and I hit the platform. I was stunned. And angry. That was quite an impact on my delicate spine. I did not make a fuss about it with the Thai’s. There was no point, it was over. Plus, I like to keep my pain private, unless I am sharing it with the world on my blog. We did not give them a tip. It was a long, hot, jostling, bumpy ride back to the resort from the muddy jungle in the open air auto rickshaw. I stewed. Pain tends to hit me hard later. This could be the end having fun on our trip. Would I be screaming in pain soon? Off to find a morphine shot? Nothing to do but wait and see. Back at the resort: It’s awful, but I couldn’t stop laughing at how hard I hit that platform. It was just funny that I wasn’t hurting so much. This video still makes me laugh. That was quite an impact. 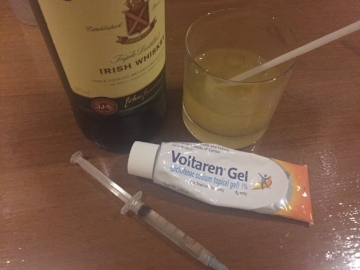 I rubbed in Voltaren (topical anti-inflammatory), made a drink, and gave myself an extra C shot. I do a second injection of C per day when I am ill or injured or under severe stress. Why? Vitamin C is crucial for repair. A human does not make his own, unlike most mammals, whose bodies not only manufacture their own, but make more in times of illness. Isn’t that fascinating? Humans and chimpanzees have a copy of the gene for making Vitamin C, but ours is an altered copy that does not work. A genetic mutation we all share. Isn’t that fascinating? The next morning, I was a bit sore. I was afraid this was the beginning of pain that would getting much, much worse. I was so mad but trying not to get worked up about it. I wrapped a bag of ice around my neck with my swim top, enjoyed my coffee and the view and hoped for the best. The hotel staff gave me a bag of ice. Then ... wait, what? The slight soreness of the morning was as bad as it got. How about that! We went back to having fun without missing a beat, climbed right back into the open air auto rickshaw and off we went. Yay for me! How is it that my born-falling-apart, then could-hardly-move-most-of-my-life body sustained that accident so gracefully? Must have been all the impact in my exercise routine: jumping jacks, ballet leaps, running, etc., which I can only do because of my daily injections of Vitamin C. Yay for me! This trip was full of surprises. When we had planned it, we had assumed that after Hong Kong I would be out of energy. 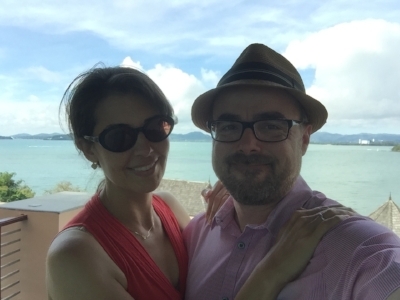 We made no plans for Thailand except to relax at the resort and enjoy the view. But after our time in Hong Kong, I was feeling great, even after the 17 hour flight and the time change. Try not to be envious, normal people, but I hardly get jet lag. I think all those years of painsomnia and straight up insomnia trained my brain to adjust to a time change quickly. When my life was ruled by endless sleep deprivation, which has been most of my life, if I napped in the afternoon, I would have even more trouble sleeping. Unfair!!!! I nearly lost my mind from those many nights awake! Nice to know it was useful for something, other than pushing the limits beyond what anyone can possibly endure. What do you think is the worst problem from Ehlers-Danlos: pain, fatigue or insomnia? I rate them in that order, wth insomnia being the worst. Nothing is worse than unrelenting insomnia. Nothing nothing nothing. The mind-numbing fatigue is also too cruel. To have no energy to do nothing! Horrible torture. The frustration of it makes me so angry. If you are sleeping at night, you have some energy to be angry, even if you have no energy to move your body. If you have slept and are not crippled by fatigued, you might be able to do something in spite of pain, and even do something about the pain. So I put pain as the least of my problems, even my 10 level spine pain. If I have slept and have some energy, I can rate that pain an 8. How about you? Back to my trip to Thailand, as I was saying, we arrived with no plans. But when we got there. I had so much energy that I’d had enough of lying around the resort on the first morning. I grabbed Mr. Pennington by the hand and dragged him off to have an adventure. We took a chance and let the locals hustle us. I mean, guys with a car on the street. Even though they spoke almost no English, we let them drive us around and show us the sites. We hoped they would be honest and trustworthy. They were! We had a wonderful time. We gave them a good tip. I petted a tiger. I was really scared. Even though they are big lazy kitties, they are very very big. Tiger, thank you for not eating Mr. Pennington. He is all I have. Emboldened by my body breezing through the zip line accident, I took a chance on surviving a Thai massage. I had heard they are great. I was curious. I started with a foot massage. The old me could hardly be touched. Wow. To my astonishment, this made my feet happy. Wait, what? We used Google Translate to say “gently” in Thai. Then I tried an hour long, whole body Thai massage, since it cost $5. Astonishment again. My body loved it. I got one every day after that. Wish I had tried this when we first arrived. An authentic Thai massage is very healthy, as the focus is on major muscle groups. It is hard to find an authentic Thai massage in Los Angeles, one where they do not throw in Swedish massage techniques. You have to make yourself very clear and insist on Thai techniques only. End of trip. On the hotel room balcony. Both of us very happy. Mr. Pennington met me when he was 22, and subsequently spent his life taking care of me, watching me get only worse, listening to me scream in pain, taking me for midnight morhpine shots, driving me to doctor appointments when I was too tired to manage on my own, all while never losing hope for me. That was awfully kind. Wow, I can like do stuff. This was my dream. Our dream. It was a long journey home, 24 hours of travel, Phuket - Bangkok - Hong Kong - Los Angeles. My hip was spasming quite badly by the end. Later I strengthened it and corrected muscle imbalances, so that stopped happening. We ate at McDonald’s at the Hong Kong Airport. I always try to go to McDonald’s in other countries. The adaptations McDonald’s makes to please the locals can be really good.